“The land of fire and ice” is a very appropriate name for Iceland, in more than one way. Not only is this the island-nation born of the vikings, volcanoes, and glaciers, but its unpredictable weather also can feel like fire and ice. 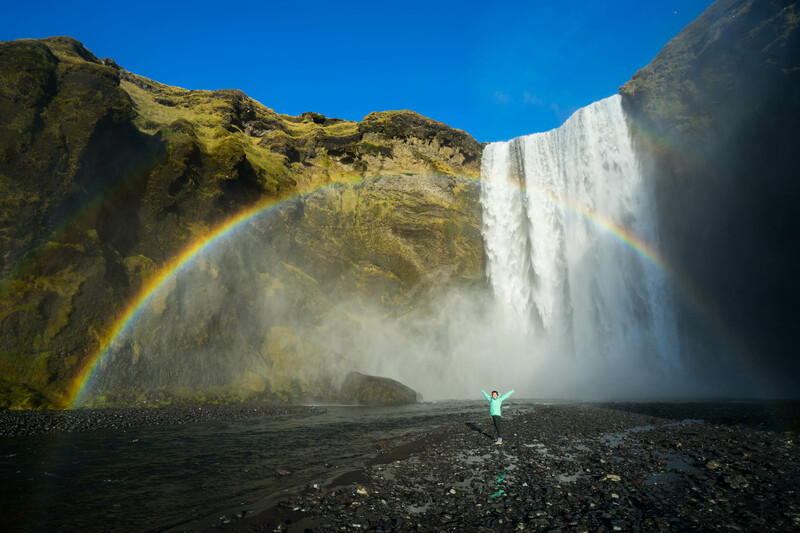 For all of the strange weather conditions – from the warmest, sunniest days to the sting of the coldest nights – you’ll want to make sure you go to Iceland completely prepared for whatever weather conditions may come your way. 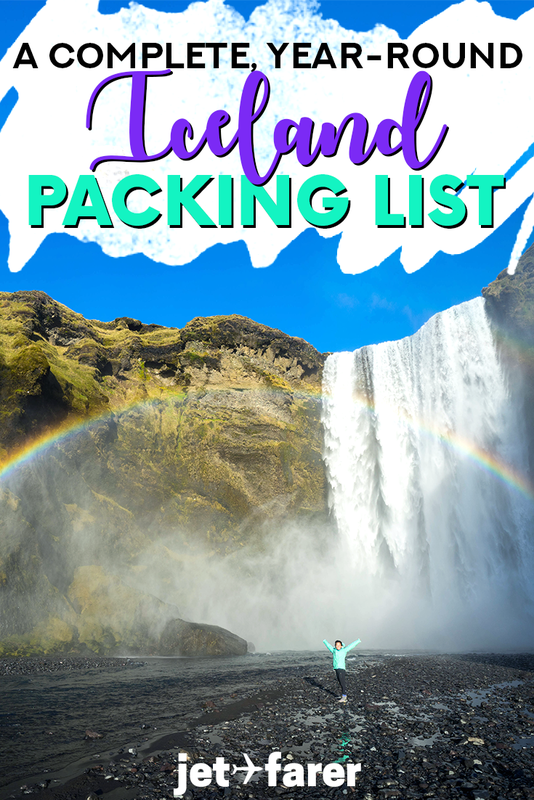 Whether you’re planning on driving the Ring Road or are simply going to take some day trips from Reykjavik, our complete Iceland packing list will help ensure that you have everything you need for your trip. Because of Iceland’s bipolar weather situation, you’ll want thick, sturdy gear to stay dry and warm in the somewhat extreme climates. The following essential items belong on every Iceland packing list, no matter the season. A warm coat is an absolute essential on any Iceland packing list. It will be your best friend in times of trouble, no matter the season. Basically, if you don’t bring a coat to Iceland, you can probably expect to be curled up in a ball shivering in your car after being outside for 10 minutes at least once during your trip. Even during the summer in Iceland, the temperature can go below freezing several times a week. Trust me, I’ve experienced traveling in Iceland without a big coat and it’s really not so pretty. Don’t be like Kay. Bring a big, fluffy, warm parka to Iceland. If you’re like me and want to invest in a good, sturdy coat, I recommend this one. I bought a very similar one for my northern lights excursion in Norway and it served me very well in the dark, sub-zero temperatures of the Arctic. No Iceland packing list would be complete without a reliable rain and wind jacket. You may come across at least a few places where the wind is so strong or the thunderstorms are so angry you’ll spend the afternoon cowering in fear in your rental car. Hopefully, during most of your trip, you’ll be able to leave your car and go exploring, as long as you have the appropriate wind and rain gear. Here’s where your trusty rain jacket comes in: you’ll want one that protects both against heavy rains and against chilly winds. I’ve survived wind, rain, and snow in my beloved North Face rain jacket; it has kept me warm and dry in so many locations around the world (men’s version here). Perks of having good hiking boots and a waterproof rain jacket. Third on the Iceland “must-bring” list is waterproof hiking boots. This ain’t no tea party; I’m talking about the tall kind of hiking boots with ankle support, thick soles, and waterproofing all over. Why? Because Iceland is WET. There’s a chance you’ll pass through rain every single day of your trip, and the last thing you want is to be trudging around muddy trails in the cold with wet, uncomfortable feet. Even if you aren’t planning on hiking much, you’ll still want a good, solid pair of boots for the rugged terrain of the Ring Road. There are a lot of different brands of hiking boots out on the market, but there’s only one pair that has my heart. My Ahnu hiking boots always feel like clouds on my feet, are completely waterproof, and help keep my feet warm and well-supported during all of my hiking adventures (men’s version here). Depending on the time of year, there may be some days you’ll want to be outside in short sleeves and shorts, and other times when you’ll want to wear every piece of clothing in your bag. The solution? A good, solid layering system. When you wear lots of layers, you can strip them off or put them back on as the weather changes throughout the day. This can help you stay flexible in cases of unpredictable weather (like Iceland). Happy as a clam on a warm day because I dressed in layers! This might be self-explanatory, but if you’re bringing a coat, rain jacket, waterproof boots, and layers to a place, you’ll probably want a scarf, hat, and gloves too. I recommend steering toward thermal materials like wool or fleece that will help keep you as warm as possible. For tech-addicted millennials like me, I recommend these screen-friendly thermal gloves (men’s version here). With these, you can use your phone without taking off your gloves, a useful tool for your Instagram game. I’d also bring a wool beanie and a fleece scarf to keep your ears, head, and neck out of the frosty cold. Despite the fact that I’ve just spent the first part of this article talking about the biting cold and harsh winds of Iceland, there are lots of opportunities to swim in geothermal pools or dive in crystalline springs. For all of these activities, you’ll need to bring a swimsuit. Some of the most famous water activities in Iceland include relaxing the Blue Lagoon, snorkeling the continental divide in Silfra, and the Myvatn Nature Baths. Every city in Iceland also seems to have a public geothermal pool. If you’re going to Iceland, chances are you’ll probably want to spend a lot of time outdoors. Despite the fact that Iceland is often rainy (or snowy), you’ll still want good sun protection to make sure your skin and eyes are well-covered. A strong, sweat-resistant sunscreen and sunglasses are a must for Iceland. In your day bag, I’d also recommend bringing your favorite chapstick and lotion, as the wind and cold can cause chapped lips and skin. The sun shines in Iceland, even in the wintertime. Iceland’s roads are often empty and vast. If you’re driving the Ring Road in Iceland, there may be times where you won’t stumble on a convenience store or restaurant for a few hours. Because of this, you’ll want to make sure your car/backpack are fully stocked with lots of snacks and water. Whenever you see a grocery store, I recommend loading up on trail mix, fruits, crackers, and sandwich materials for your trip. In terms of water, Iceland has some of the cleanest spring water in the world. To help Iceland keep its springs and parks clean of plastic waste, I strongly urge you to bring a reusable water bottle and purification system instead of buying disposable plastic bottles. You can fill your water bottle anywhere, from restaurants and shops to waterfalls and springs, and if you bring a good filtration system (I use both a water filter and a UV purifier in my water to cover my bases), your water will be clean and safe to drink. To carry everything from this Iceland packing list, you’ll want a durable backpack, preferably with a comfortable back/shoulder system and a waterproof cover. This way, your stuff will stay compact and dry for the duration of your trip. For any kinds of adventures in rugged environments, I always recommend my Osprey 65L backpack with the appropriate rain cover (men’s backpack and rain cover here). Ah, springtime. The sunlight comes back to Iceland, the roads begin to open back up, and it’s an overall tranquil and beautiful time to travel in Iceland because the summer crowds haven’t arrived yet. Car USB charger: You may be be driving long distances and spending a ton of time in your car, so you’ll probably want to grab a USB charger for your rental car to charge your electronics. A headlamp: It still gets dark in the night time in the spring, so be sure to bring your headlamp if you plan on staying outdoors late in the day or camping. A sleeping bag or linens: It might be too early to camp in Iceland during the spring, but you can save a lot of money in guest houses by choosing “no linens” and bringing your own sleeping bag or blankets. Traveling to Iceland in the summer will give you better chances of warm weather, and enables you to participate in activities like X and Y. However, this is also the most popular time to travel in Iceland, so be ready for larger crowds and more road traffic during this time of year. Solar-powered rechargeable battery pack: With sun almost 24 hours a day, you can use this awesome solar-paneled battery pack to recharge your devices on the go. An eye mask: Whether you’re staying in hotels, guest houses, or camping, you may have trouble sleeping due to the midnight sun. An opaque eye mask can help you get better shut-eye in the light of day. Bug spray: In the summer, midge flies swarm around the lakes in Iceland. They’re harmless, and (to my knowledge) don’t bite, but if you don’t want bugs all over you I’d recommend carrying some bug spray. Allergy medication: Lupine and other flowers grow all over the roadsides in Iceland in the summer. If you’re sensitive to pollen, you may want to bring some allergy medication with you. Camping gear: Summer is the best time to go camping in Iceland, so if you want to maximize your outdoor time, be sure to bring your tent, sleeping bag, and camping gear. Fall in Iceland: more beautiful than spring or summer? Believe it or not, when I went to Iceland in the fall, I experienced tamer weather and more sunshine than when I went in the summer. Maybe this was a total fluke, but I’m on team “Travel Iceland in the Fall” for sure. A headlamp: It gets really dark in the evenings in Iceland, and with each day in the fall it gets darker. Be sure to bring a headlamp, especially if you’re planning on hiking into the late afternoon. Music festival clothes: Iceland’s largest music festival, Iceland Airwaves, is a fall favorite in the region. If you happen to be in Iceland during this time, I’d bring some casual (non-hiker) clothes for wearing to the concerts. Winter is Iceland’s most desolate time of year, with some days in complete darkness, but it’s also one of the most serene and beautiful times of year. A lot of the waterfalls begin to freeze and a layer of snow covers the landscape. A headlamp: Iceland is dark almost the entire day during the winter, with many hours of the day lit only in a dusky blue. A headlamp can help you explore some of the famous sights near Reykjavik even in this bleak light. Extra layers: Winter is really freaking cold in Iceland. Dress accordingly. Hand/foot warmers: I recommend you bring these in addition to your extra layers, especially if you’re hoping to stay out all night and catch the northern lights in Iceland.